Sambu Construction Co. has been awarded a $91.24 million rail-tunnel project ordered by Pakistan's National Highway Authority (NHA). Sambu Construction? landing a large-sized civil construction project in a foreign country is rare as most Korean contractors have been intensified efforts to win overseas orders on petrochemical plant and desalination-power plant projects. A contract, inked by Sambu Construction Sept. 19, calls for constructing an 8.6 km-long tunnel and a 5.8 km-long approach road in Lowari, the northernmost, mountainous area of Pakistan, for a 36-month-long construction period. Earlier, Sambu Construction signed a $14.51 million deal to build a 46 km-long road linking Mianchannu and Sahiwal last June. A $2.61 million Quadirpur-Rawan road project, also landed by Sambu Construction, broke ground in the same month. An official in charge of overseas business at Sambu Construction, said, "Sambu Construction has been recognized for its excellent construction know-how and unwavering sincerity since its entry into the Pakistani market. Our company has demonstrated its price and technology competitiveness by landing the latest project, outbidding a Chinese bidder which submitted the lowest price. "Korean contractors' focus on winning plant projects has lowered the portion of winning civil construction orders out of the total overseas contract amounts to the 5 percent level, but the latest bidding showed that Korean companies still have enough a price competitive edge in the civil construction sector to compete with developing countries, he said. 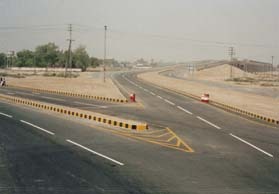 Sambu Construction constructed the Multan-Mianchannu additional carriage project in Punjab, Pakistan, between April 1994 and May 2001 and the Multan-Sahiwal carriageway improvement & repair project in Punjab between August 2003 and February and 2005. Established in 1948, Sambu Construction has gone through ordeals and hardships to reposition itself as one of Korea's top-notch construction contractors with its unwavering commitment, enthusiasm and workman-ship. Sambu Construction is now striving to become a world-class contractor. To this end, Sambu Chairman Cho Nam-wook expounds 3Cs (Clever, Concentrative and Confident). He urges all staff members to be clever, be full of confidence and concentrate on their own jobs, and he stresses that they should not overlook anything of the 3Cs to achieve a victory. They are required to know many things to be clever, so they have to study hard, perform duties aggressively and creatively. If they exert themselves to do their job with confidence and with their whole heart, Chairman Cho say, they can mange to make their own way at capacity to overcome any hardships. Corresponding to the prestigious holder of Korea's fist construction license, Sambu has earned a reputation for its technological prowess in conducting civil works in Korea and abroad. Sambu's flawless construction of the nation's first-ever under-riverbed subway tunnel linking Mapo and Yeouido is one example of the achievements the contractor has made. Sambu was awarded with the Gold Medal for Civil Engineering Construction in recognition of its successful completion of the Under-Riverbed Subway Project at the 28th IFAWPCA Convention in Seoul in 1996. The construction technology, the first of its kind in Korea, shortened the construction period and lowered construction costs. The company has demonstrated outstanding technologies in the construction of major dams for exploiting the nation's water resources, roads, harbors, railroads, subways, bridges, etc. Sambu's technological prowess is not limited to the domestic front. It has been involved in civil construction, architecture, plant and various other works around the world, including Saudi Arabia, Malaysia, Nepal and Pakistan to serve as Korea? representative contractor with a sense of responsibility. Sambu has contributed to the construction of the nation's infrastructure, a driving force behind its economic stride. It started with the construction of the nation's first-ever highway between Seoul and Incheon, and the company participated in the construction of the Seoul-Busan Expressway, the Honam and Namhae expressways, Yeongdong and Honhae expressways through the Taebaek Mountain Range, and the nation? 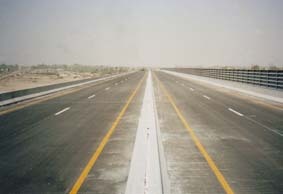 first-ever expansion and concrete pavement of the Busan-Masan Expressway. Taking the most of the accumulated technologies, Sambu has strengthened its presence in foreign markets by implementing such projects as the construction of the Malaysian truck line, Federal Highway No. 2 and the Kuala Lumpur-Petaling Jaya Traffic Diversion Scheme Stages I and II. Careful planning and responsible craftsmanship have made Sambu recognized for their reliability and experience especially in building bridges. It successfully built the 1,050 meter-long Hwangsan Bridge, Asia's longest ILM (Incremental Launching Method) bridge, Gemnam Bridge, the nation's first-ever concrete box bridge, Baekje Bridge, based on the Well scheme, and Yeonyuk Bridge of Ahheung Port, which is expected to help realize a vision of developing the nation's western coastal area into a business hub. 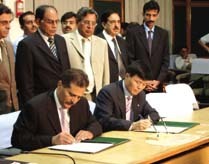 Representatives from Sambu Construction Co. and Pakistan's NHA sign a $91.24 million contract on the Lowari rail-tunnel project in Pakistan Sept. 19.